Why the 2006 Volkswagen Jetta? The Jetta has top crash test results in the IIHS front offset and side impact crash tests. Additionally, Electronic Stability Control is standard on most trim lines. The quality of the interior materials is unmatched in its price range. Every surface has a nice grain and a soft feel, and it is all put together very well. The Jetta has excellent handling at high speeds, with precise steering and good road feel. At low speeds (in parking lot for example) the steering is a bit light but it firms up once you get going. Controls are exceptionally simple and well placed. Every control except the cruise control is lighted at night. The gauges are a beautiful indigo color, and the controls are illuminated in red. The car has held together very well in the 26,000 miles I have owned it. True Delta and Consumer Reports both show that reliability is good and improved considerably over older VWs. Why Not the 2006 Volkswagen Jetta? I generally like the dealership I go to (Byers Imports in Columbus). However, I probably read a horror story from other dealers online every other week or so. It ranges from dealerships damaging cars, incompetence at fixing things, to just being rude. I liked the color choices available in the 2006 model year (especially Spice Red, Indigo Blue, and North Sea Green). However, the current colors are somewhat uninspired overall. 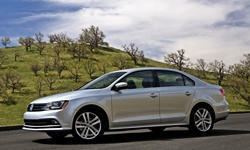 The incentives for the Jetta are usually aimed at leasing cars rather than selling them. You have to time it right if you want to buy a car and get the best deal.